Daniel Boulud Will Close His Downtown Gastropub DBGB Next MonthThe sausage party will end on August 11. Daniel Boulud’s Restaurant Fined $1.3 Million for Serving Diner a Piece of WireThe jury called it a warning to the industry about wire brushes near food. A Lineup of World-Class Chefs Will Cook a Tribute Dinner for Roger VergéIncluding Daniel Boulud, David Bouley, Emeril Lagasse, and more. Iconic Chef Daniel Boulud Will Honor Sous-Chef’s Colombian Heritage on New MenuTen years ago, Cesar Gutierrez was a troubled teenager. Now his food will be served at the acclaimed restaurant. Daniel Boulud Now Serves NYC’s Fanciest BoilermakersThere’s an entry-level bourbon and pilsner, but also a tart cider paired with Serbian plum brandy. Watch Daniel Boulud Make Magic Out of Stephen Colbert’s Pantry ItemsCharming. You Can Get a Whole Roasted Pig Delivered on Super Bowl SundayThis is how Daniel Boulud does game day. Hester Street Fair’s Ice Cream Social; DBGB’s Anniversary SausageToday’s Leftovers. James Beard Foundation Launches Live-Stream Kitchen CamTune in to see all the action. Daniel Boulud Taking Over Boston Restaurant AsanaIt happens in September. Rôtisserie Georgette Opens on the Upper East SideWith black truffle mashed potatoes for $15, no less. 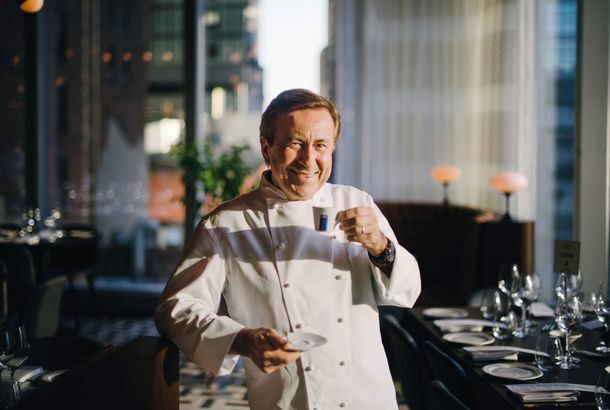 Daniel Boulud in Conversation With Budd Mishkin; Maison Premiere’sPlus: Brushstroke’s $59 bento box, and more, in today’s Leftovers. First Look at the New DB Bistro Moderne, Reopening TomorrowThere’s also a brand-new menu. Blue Hill Launches Savory Yogurt; Daniel Boulud and Wolfgang Puck Team UpPlus: a miso demo, and more, in today’s Leftovers. Former Boulud Marketing Maven Georgette Farkas Goes From the Corporate FryingWith the opening of Rôtisserie Georgette. Ghaya Oliveira Named Pastry Chef at Daniel“I slowly worked my way up,” the chef says. Daniel Boulud Opening DBGB Kitchen & Bar in Las VegasThe Lyon-born, world-acclaimed chef is taking his East Village sausage palace to Las Vegas. In Season: Daniel Boulud’s Mixed Greens With RhubarbTry this supremely sour greens-and-rhubarb recipe from his cookbook Braise. Here’s a Look at GoogaMooga’s Chef-Themed Trading CardsSo who gets to be Chewbacca? Daniel Boulud’s Single-Malt Scotch Debuts; Kin Shop’s New SpringPlus: cocktail class at the JakeWalk, and more, in today’s Leftovers. Tickets for the Manhattan Cocktail Classic; Momofuku Ko’s AnniversaryPlus: new entertainment at the Lambs Club, and more, in today’s Leftovers. Bitching Is Part of the Chef’s Job DescriptionDaniel Boulud’s a perfectionist. Daniel Boulud Now Has His Own Line of Single Malt ScotchThe highlands are calling.